New Video: Good Mood Foods that make you feel HAPPY + Smoothie Recipe! This video is all about good-mood foods that are clinically proven to work as an anti-depressant and help you to feel HAPPY! These are some of my favorite foods that I eat just about every day because it is so important to stay energized and happy in order to follow your purpose and passion in life! If some of these good-mood foods will help you to accomplish that, I say go for it! The smoothie recipe is one of my favorites that I drink almost EVERY day because it’s that good and it helps me to feel good too! Real Talk: About HAPPINESS & Being Healthy + Happy! New Video all about happiness…plus, more on my healthy and happy journey! Farmers Market + Grocery Haul! I do love seeing whats in season and getting meal ideas. It’s actually really fun! So fun, I made a little video about it, which isn’t the first…or the last video I will make about this place! This week I visited the Silverlake Farmers Market on a HOT Tuesday afternoon! P.S. eating locally and seasonally is good for you and the planet! Support the farmers! It has been SO hot in Southern California I decided to do a video on summer super quick and easy snacks I’ve been eating lately! These are so easy to make and are super delicious! Try them out and let me know what you think! New “What I Ate Today” Video Is Up! Check out my latest video “What I Ate Today” and let me know what you think! What is my diet? What is HCLF? WFPB? New Youtube video is up! I’m excited because I’m on a mission to start shooting YouTube videos regularly and get them out once a week! This is quite a goal considering I am learning to edit and do everything all on my own, but I’m up for the challenge. I would love your feedback on any suggestions you may have for future videos! Thank you for watching…and please subscribe to my YouTube channel!! It seems as thought the best creations come together when not knowing ahead of time what I’m going to make and also being in a hurry. It just goes to show it doesn’t always take a lot of money or time to eat healthy plant-based foods!! It does help to have your staples handy though…Speaking of, want an easy guide of must-have staples to always have in your kitchen? Just put your email address in the line at the top and I will send you a “getting started” grocery list! In the mean time chop up some organic white mushrooms and put them in a pan with broth and seasonings- I used fresh chopped garlic, red pepper flakes, cayenne pepper, gluten-free soy sauce, garlic powder. Cook down until the mushrooms are shrunk, you are essentially making a concentrated mushroom stock to pour over all the ingredients this will give the dish the most flavor and a broth, light gravy-like consistency. Saute some beans (I used chickpeas because I’m obssesed) in veggie broth and seasonings. When everything is cooked stir everything together or layer one in a time in your bowl. Above I mixed the rice, steamed veggies and mushroom broth together in a bowl and then topped with the chickpeas. * You can top the final dish with salsa, nutritional yeast or fresh avocado! 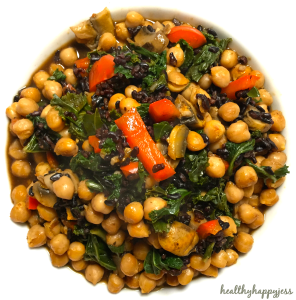 This meal is healthy, gluten-free, vegan, filling and satisfying; you can use so many variations based on what you have on-hand and what you might be craving at the time. Easy Tasty Vegan Butternut Squash Soup! This is my new favorite go-to soup at the moment! 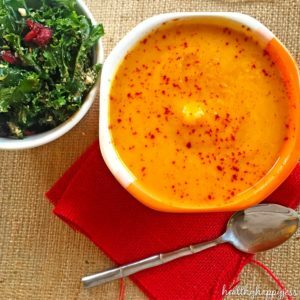 I love pairing it with a kale salad (see my recipe for the best kale salad here) you will feel warm, healthy and wonderful after this meal! 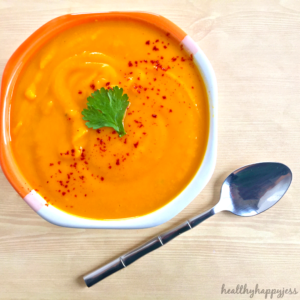 Delicious, easy butternut squash soup recipe that is healthy, vegan and gluten-free! Steam- Throw both bags of butternut squash in a pot to steam along with your cut up and peeled honey crisp apple. While it is steaming get a separate pan and put olive oil, minced garlic, grated ginger and all seasoning and begin to sauté it lightly until it starts to bubble, turn down heat and add coconut milk. Once the cream is broken down, stir together all ingredients and remove from heat and set aside. When your butternut squash is done (fork should easily press through) remove from heat, drain, rinse with cool water and then throw it in your blender along with cooled coconut milk seasoning. Transfer this mixture into your large pot and heat! Ever wonder what to do with that leftover canned pumpkin purée? Why not make a smoothie? 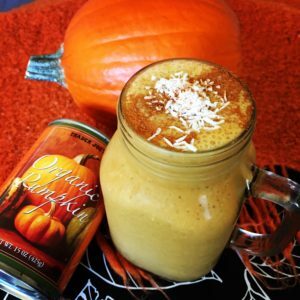 Pumpkin is SO good for you…I even did a video about it! It’s full of antioxidants and vitamin A which will keep you looking and feeling vibrant! You can soak your oats for an hour before you blend them if you have time. You don’t have to be exact with the recipe amounts, use what you have and experiment.